Though I have continued taking some good bird pics, I have wanted to move to a higher level with a high quality and longer telephoto zoom. I finally took the big step and my new Canon EF400mm 5.6 USM lens arrived today. I had to go try some bird pics so I drove to a herony where I have been frustrated as I hadn't been able to get very good pics because I won't risk disturbing these nesting birds by going too close even though I stay in my car to reduce disruption. 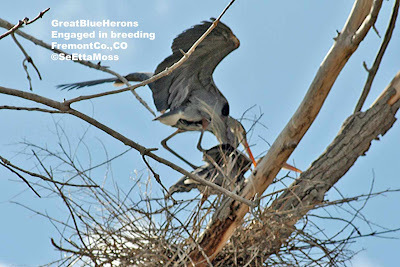 So I took several pics of a small group of Great Blue Herons that were either on the nest or still building nests. Then I stopped to watch and give them a break from the noise that the electronics in digital cameras make. I was closely watching a pair that were standing very close together in their partially built nest. Then one of the herons mounted the other to engage in breeding.